It’s that time of year again: Pumpkin Season. 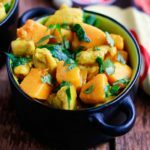 And since I adore anything with pumpkin in it, here’s a savory, comforting recipe for Pumpkin Curry to warm your soul. To be honest, I’m a hot weather girl to the core. I could live with warm, balmy weather all year round. But one thing that I appreciate about cooler weather is that it mean Pumpkin Season is here. Pumpkin smoothies, pumpkin chia pudding, pumpkin hummus, pumpkin desserts. 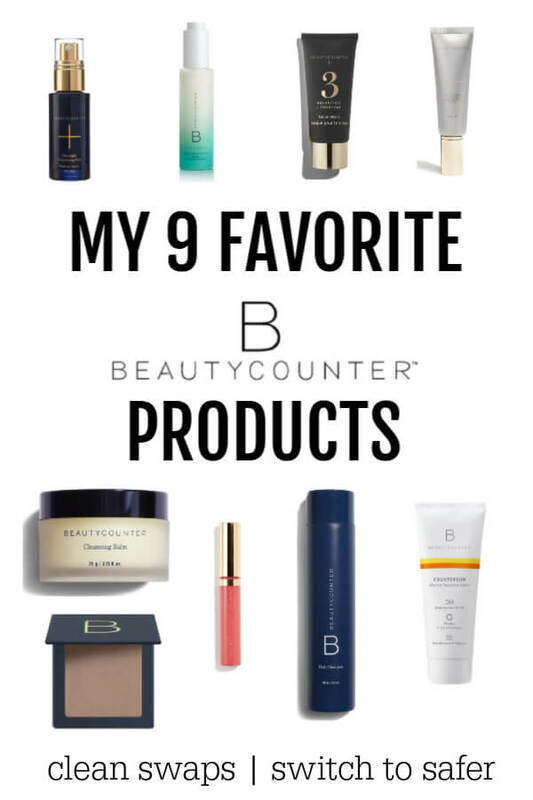 You name it, I love it! This recipe was inspired by the cute little sugar pie pumpkins growing in my garden. I was thinking of making pie, but then the weather went from 100 degrees and sunny to cool, misty and cloudy. Time for some comfort food! 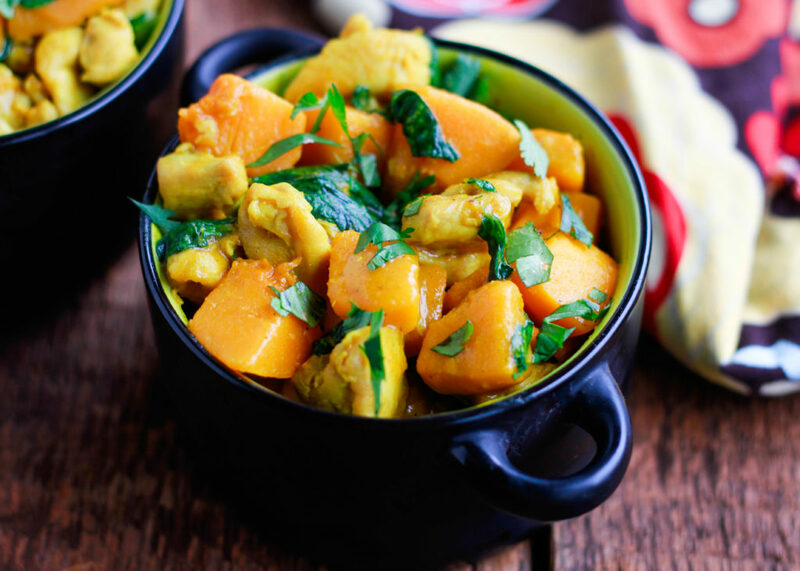 Pumpkin curry has always been a favorite of mine at both Thai and Indian restaurants. I tend to favor Indian food as it is less sweet. 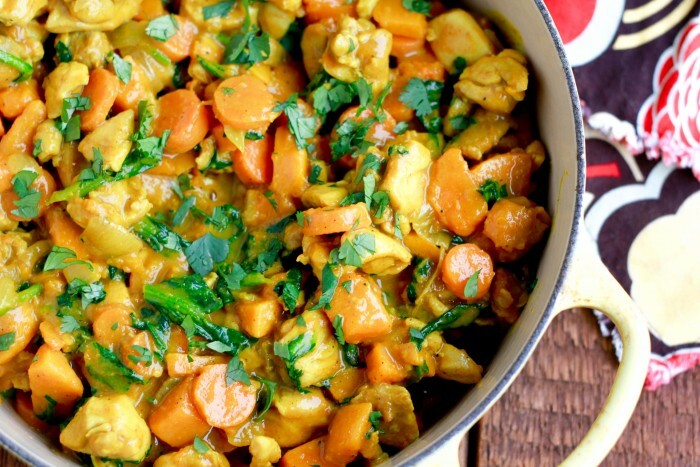 This curry is more of an Indian curry. I like to mix my own spices, but feel free to use a pre-mixed curry powder if that’s what you have. The warm and cozy flavors of this dish will make this a cold weather favorite. 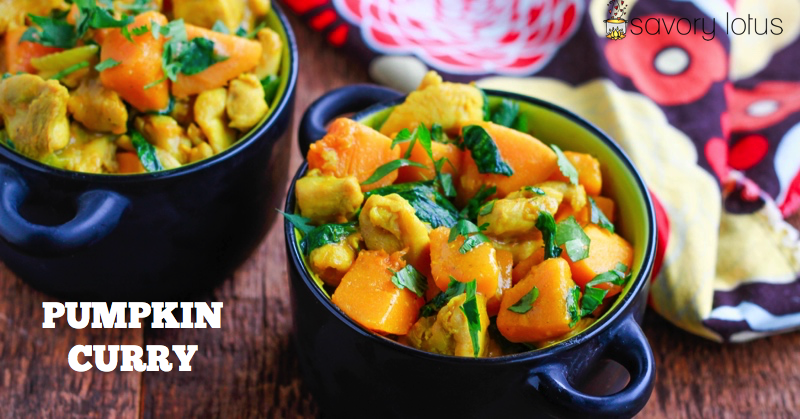 Full of protein and hearty, nutritious pumpkin, you will feel nourished and full for hours. The lemon and cilantro added at the end give it a fresh and zesty flavor, really balancing out the spices. I usually eat it by itself but feel free to serve it over cauliflower rice or white basmati – if you belong to team white rice! Cut pumpkin/squash in half using a very sharp knife and scoop out the seeds and stringy parts. Place pumpkin/squash cut side down on a cutting boards and brace with one hand while you use a vegetable peeler or very sharp knife to remove the peel. Then chop into bite-sized pieces. Enjoy! Look for more tasty pumpkin recipes coming soon! Combine turmeric, coriander, cumin, garam masala, 1 tsp salt, and grated ginger in a small bowl. Set aside. Sprinkle the remaining 1/2 teaspoon of salt over the chopped chicken pieces and toss to coat. Heat 1 tablespoon of coconut oil or ghee in a large pot over medium high heat and saute chicken until no longer pink on the inside- about 6-8 minutes. Then sprinkle on half of the spice mixture and cook another minute, until fragrant. Remove chicken from pot and set aside. In the same pot, heat the remaining tablespoon of coconut oil or ghee over medium heat. Saute chopped onion until translucent. Add the remaining spices and cook another minute until spices are fragrant. Throw in pumpkin and carrots and toss to coat. Then pour in broth and coconut milk. Bring to boil, then turn down heat and allow to simmer until pumpkin is fork tender but not mushy – about 18-20 minutes. Add chopped greens and cooked chicken and cook another 2-3 minutes- until greens are wilted. Add additional broth if you want it to be more soupy. Turn off heat and add lemon juice. Adjust for salt, pepper, and lemon to taste. 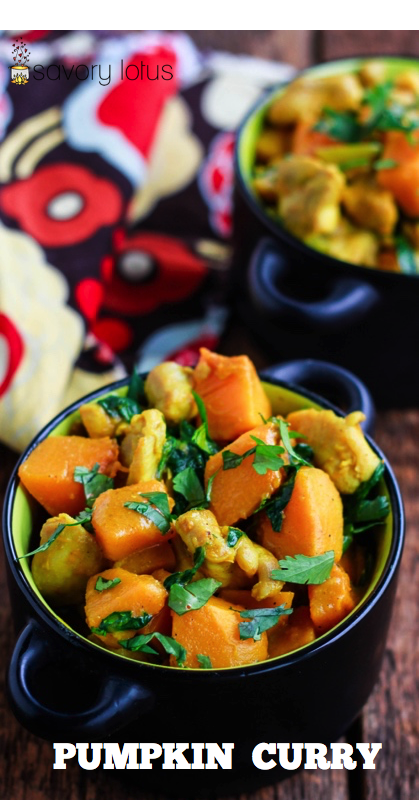 Even though this is a pumpkin curry recipe, feel free to use any winter squash that you have. You can substitute the dry spices in this recipe for 1 tablespoon of curry powder. Be sure to still add the salt and grated fresh ginger. Hi there! So excited about this website and all the recipes you have posted. 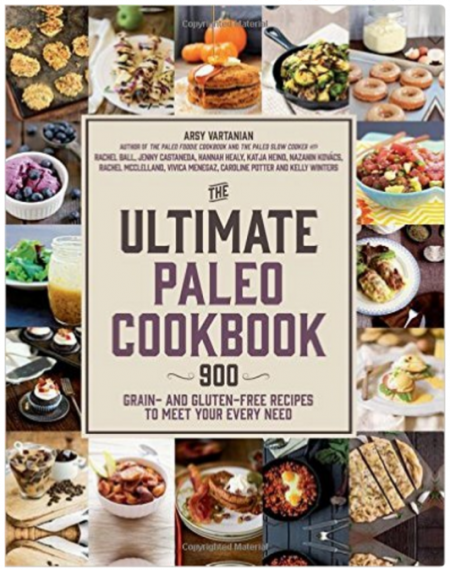 I have been considering going more paleo/gluten free in my diet but didn’t think I could until I saw all these delicious easy recipes here! Wondering if you think I could throw all these ingredients for the pumpkin curry into a slow cooker and have it turn out ok? Thanks! Hi, Andrea! Yes, you can definitely make this in a slow cooker. YUM! Thanks for the kind words. Hi, Margie! Yes, sorry about that. You add the chicken back in with the greens. I fixed the recipe. 🙂 Hope you enjoy! Hi Katja!! this was absolutely amazing!!! We made it last night and now I’m going to have some for breakfast, it was so good!!! thanks for the wonderful recipes! !